The Rankin Science Observatory (RSO),is the instructional facility on the main ASU campus and is used for teaching advanced undergraduate astronomy courses in observational techniques. 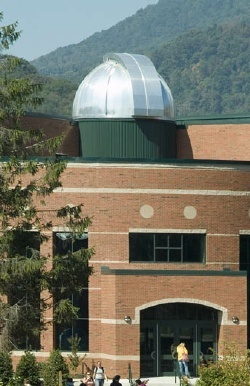 The RSO is next to the rooftop GoTo Lab Facility, used in the Introductory Astronomy course. Shown at left is Observa-Dome on the Rankin South building. 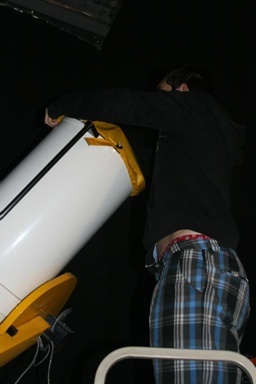 The dome and 16-inch telescope were provided by a grant from the National Science Foundation, which has also funded instrumentaton and modifications that allow the facility to be used remotely. This dome and its telescope are primarily used by students in an advanced courses in Observational Astronomy and technique courses in photometry and spectroscopy. Its non-student use time is often applied toward research projects by faculty and their students. Photo at left by former ASU Photographer, Mike Rominger. 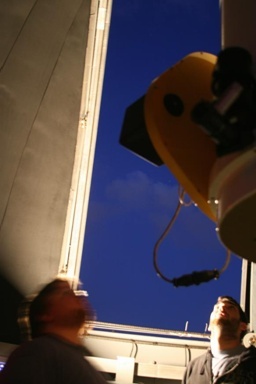 The DFM Engineering 16-inch telescope isshown at right being set up for a night of observing by students in the advanced observational techniques coures. The telescope is operated in the climate-controlled control room shown at right. Computers control the telescope, dome and cameras used to obtain astronomical images. 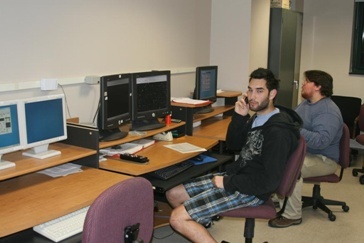 This kind of comfortable control environment is part of all ASU observatory domes. Weather monitoring equipment and an all-sky camera allow observers to keep an eye on changeable weather (see below).